Classical Net Review - Maestrino - The Stokowski Sound - Part II "The Early Years"
The Stokowski Sound, Part II "The Early Years"
You may have some difficulty finding these discs. A member of the society sent me a set he got at Tower Records as a "Special Import". According to the New York branch of Philips there are no plans to make the series generally available in the U.S. It is worth the effort, however, to add these to your collection. It is a Five Star set. As a form of segue, I was offered some inside information about these recordings. Ed Johnson, arguably the finest Stokowski expert in the world today, and I have been corresponding about the Stokowski Sound. He informed me that Stokowski was unhappy with the original master tape. He had the engineers take the master, play it inside a church and re-record it with this added reverberation!! The Stokowski Sound was as much a part of the Maestro's involvement in the recording process as was his work with the orchestra. He kept tight control over what was issued, rejecting takes that were not to his satisfaction. The above example of manipulation of the recording is but one. Figure 58: The quaver before figure 58: someone plays an open string: If possible use another take: if not try to soften by lowering the level at this point. There are similar extensive directions for the rest of the recordings and the Brahms 4th Symphony. The phrase that appears most often is "more reverberation". I believe this "sound" that Stokowski produced, especially the sense of reverberation, is a direct result of his beginnings as an organist. Have you ever sat at an organ and played for just a little bit? The experience is one where reverberation literally stimulates your whole body. What Stokowski could not capture in the recording studio, he learned to add in the mixing room. This is why, again, it is vital to the person hearing a Stokowski recording that it honestly reflects what he was creating. To merely go back to original tapes is not enough. You have to go to the tapes Stokowski authorized. 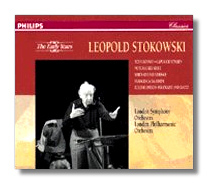 There may be honest disagreement as to how faithfully a recording reflects the Stokowski sound. What cannot be argued, however, is that some recordings do not have it. I submit for your consideration the contrast between the two CD issues discussed in this section. Get "The Early Years"!! !